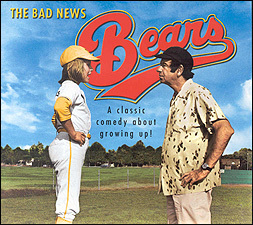 The original 1976 "BAD NEWS BEARS" (with Tatum O'Neal and Walter Matthau) belonged to the North Valley league, and sure enough, the movie's baseball scenes were filmed in the north San Fernando Valley . To be exact, the Bears' actual baseball diamond was in Mason Park (also called the Mason Recreation Center), which is located at 10500 Mason Avenue, in Chatsworth, CA. (The 2005 remake of the same film (with Billy Bob Thornton) was shot at Franklin Fields (and Mid Valley Fields), which are located at 17301 Oxnard St., in Encino. The 1976 thriller "MARATHON MAN" (with Dustin Hoffman, Laurence Olivier and Roy Scheider) was mostly shot in New York, of course. But as usual, Hollywood can't resist faking a scene now & then by shooting locally. 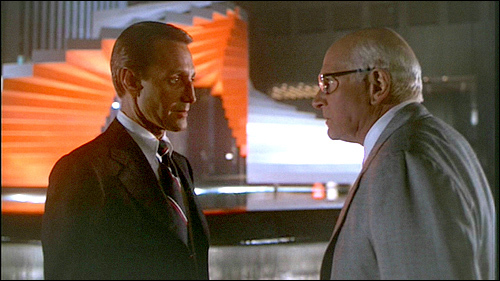 And the scene where Roy Scheider meets with Olivier (and comes to a bad end) was filmed in downtown L.A., next to the red fountain in ARCO Plaza (later known as City National Plaza or Bank of America Plaza) , at 333 South Hope St. The same red sculpture was seen in "Pretty Woman", and more recently, in several episodes of "Heroes", where the plaza is referred to as New York's "Kirby Plaza". Click here to see a page with a lot more information about the movie's L.A. locations. Remember the final scene goodbye between Woody Allen and Diane Keaton in 1977's "ANNIE HALL"? It was filmed at "The Source" restaurant, at 8301 Sunset Blvd. (between Crescent Heights and La Cienega Blvd. ), in West Hollywood. The Olympic was also the site of the wrestling scenes in Jim Carrey's 1998 film "MAN ON THE MOON" (the life story of Andy Kaufman), and the same auditorium was the venue for the kick-boxing match in the 1995 virtual-reality adventure, "VIRTUOSITY," starring Denzel Washington. But the opening shot of the original, "ROCKY" (where you first see a large mural of Jesus overlooking the gym) was filmed on location at the old Resurrection Gym, on 1114 S Lorena Street, in East L.A., where fighter Oscar De La Hoya trained as a youth. The place started out as a church back in 1924, then became a gym, and now it's been restored, and has become the Oscar De La Hoya Boxing Youth Center, opened by the fighter in hopes of keeping inner-city kids out of gangs. Remember the Eagles' song, "Hotel California" ? Well the "pink palace" on the cover of that 1976 album is none other than the Beverly Hills Hotel (at 9641 Sunset Boulevard) in Beverly Hills. The hotel has starred in countless movies, including "THE WAY WE WERE" (1973), "SHAMPOO" (1975), Neil Simon's "CALIFORNIA SUITE" (1978), and "AMERICAN GIGOLO" (1980). If you saw "THE STING" (1973) with Robert Redford and Paul Newman (and who didn't? ), then you'll remember the scene where the hookers rode the merry-go-round. Well, that scene was shot at carousel on the Santa Monica Pier, located at the west end of Colorado Avenue. The pier area was also the site of 1994's "BEVERLY HILLS COP III" and many other films. Remember the posh gambling casino that Redford & Newman ran in 1978's "THE STING" ? Those scenes were actually shot at the unique Castle Green apartments in Pasadena (99 S. Raymond Ave.), which were built in 1898. With its spectacular towers, turrets and grand staircases, the Castle Green has been the location of many Hollywood productions, including "THE LITTLE RASCALS" (1994), "BUGSY" (1991), "SNEAKERS" (1992), "WILD AT HEART" (1990), and the TV series "Murder She Wrote" and "Sisters." The final shoot-out between man & ape took place in 1972's "CONQUEST OF THE PLANET OF THE APES" (starring Roddy McDowall); those furious battle scenes were actually shot at the bridge spanning Avenue of the Stars in Century City, just south of Santa Monica Blvd. and north of Constellation Blvd.